This is one of my favorite meals hand down. It is good for you, has great color, and it pretty simple. My husband helps me out on this one. You are going to want to put in your sweet potatoes about an hour before you want the food on the table. Wash them thoroughly, cutting off any bad parts. Prick with fork all over and place on foil lined cookie sheet in 400 degree oven. Cook for 45-60 minutes depending on size. They are done when you can squeeze gently. Split length wise with knife and put dollop of butter inside. Mix. You can eat the skin on this and it will be delish! You will saute the green beans on the stove top in large pan. Put in a little olive oil and toss. Sprinkle a little garlic salt on top and cook until done. Usually about 20 minutes or so. My husband cooks the salmon on a cedar plank (follow directions on cedar plank package). Lightly season with garlic salt and pepper. Cook for 20-30 minutes or until flakes. Don’t over cook or it will be too dry. Make sure to peel off skin. Love love love this meal. You don’t feel awful or guilty after eating, just that you have had a very healthy, well-balanced meal. Sweet potatoes are extremely high in nutrients and are one of the best foods you can have in your diet. Try eating them at least once a week. Source: Just one of my favs. 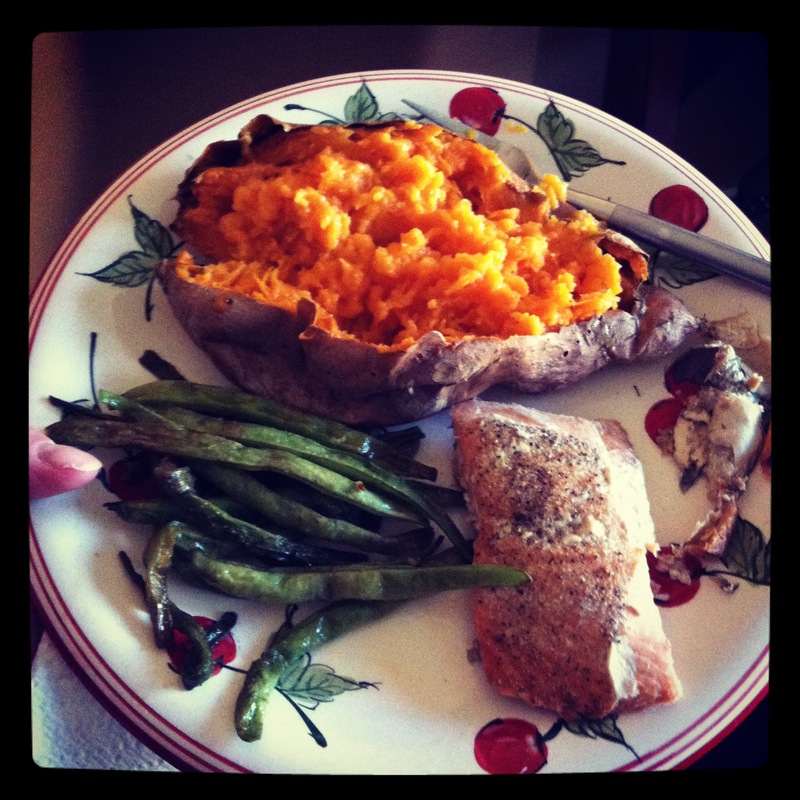 Texas Roadhouse has a great salmon and you can get a sweet potato as one of your sides. Their green beans aren’t exactly the same, but you could do whatever other side you wanted.